MotoGP world championship leader Casey Stoner has admitted he was surprised at his fast and consistent pace on the opening day of practice for the German GP. 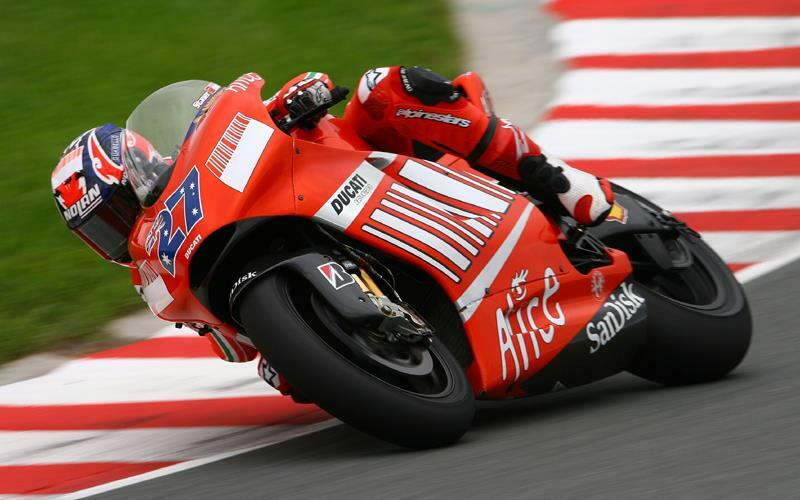 Stoner left his rivals trailing in his wake after another impressive performance on board Ducati's factory GP7 as he topped the timesheets in both free practice sessions. Stoner was over 0.3s clear of closest world title rival Valentino Rossi in this afternoon's second session, but was even more dominant this morning when he was over 0.6s clear of the field. The 21-year-old said even he was surprised to be so far ahead of the pursuing pack. "This morning yes I was surprised. A lot of people say how fast I was going but I prefer to say how slow everybody else was going. In the afternoon session I was expecting everybody to arrive at the same time like this morning. Obviously this afternoon we were still quite fast, but everybody else caught up a lot. So I think this morning we had a good setting immediately out of the box and we were able to do pretty good lap times, "said Stoner, who said he liked the new track surface at the Sachsenring, but was one of several riders to voice concerns about two big bumps at Turn 13. Nicky Hayden crashed at the fast left-hander this morning when he lost the front end of his Repsol Honda on the bumps and Stoner said: "The new surface I actually found quite good. The only thing is where Nicky crashed this morning there is two very, very big bumps there. They really need to take away that part of the tarmac and put in some new things, because it was really big. It makes the front end of the bike bottom out and it's a little bit scary." Stoner also said the blind entry to the super-fast Turn 12 downhill right-hander was particularly bad. Alex Barros crashed heavily this morning and Stoner added: "Coming over of the top where Alex crashed, maybe four laps previous to that I had the exact same moment. I didn't crash, but I had a big lose because there was oil across the track and they really did not do a good job to take away the oil, because every time you changed direction, you were very close to high-siding. I think myself, (Michel) Fabrizio was close, also Loris (Capirossi). It was a little bit dangerous this morning. But this afternoon, maybe it was a little bit better, but I think everybody was just cautious."